Notes: This fly was designed by Greg Vinci around 2002. Greg is the owner of Sierra Pacific Products which manufactures and distributes innovative flyfishing tools and materials. Andy Burk introduced the fly in an article of the May/June 2005 issue of California Fly Fisher. The fly produced very well on the Truckee, particularly within pocket water. 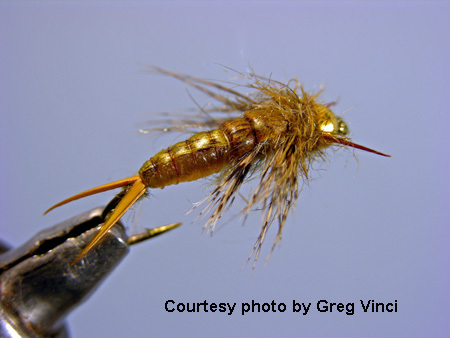 The fly can be tied in a number of different colors and sizes to represent Golden Stones, Black Stones, and other stoneflies. The use of Scud Back material for the abdomen produces a very translucent effect showing the color of the underbody.This material and being heavily weighted gives the pattern many of the quick sinking characteristics of the Czech Nymphs. The fly has an especially heavy thorax that is covered by a scudback wingcase. Greg also utilized a soft hackle approach by making only one turn of Partridge hackle behind the bead. The result is a very buggy looking stonefly with a streamlined translucent abdomen.